What is the most shocking part of today’s gospel (Matthew 1:18-25, Advent 4A)? What’s the thing that makes you wonder whether it really happened the way Matthew describes? What’s the hardest part to believe? For most people, I suspect, the thing that raises questions, controversy, and debate is Mary’s virginity. Joseph has decided to dismiss Mary. He’ll send her away. They can just go their separate ways and get on with their lives. We should’t be too surprised. Isn’t that what we tend to do when we don’t understand? We dismiss what makes no sense. We turn away from possibilities that don’t fit with our ideas, beliefs, and experiences. Joseph knows better than to believe babies are made without a man. So do we. Joseph knows what he believes and believes what he knows. And that’s the problem. It’s too small. It’s too narrow. It’s too limiting. I suspect there are times when we’re probably a lot like Joseph. How many relationships have been lost because it just didn’t make sense that those two should be together? Race, money, religion, families. For whatever reason we just couldn’t imagine it ever working so we never gave it a chance. Have you ever given up on someone because it seemed all they did is offer one unbelievable excuse after another? Did you ever pass up an opportunity or let go of a dream because it seemed too implausible? So we chalk it up to just another crazy, irrational, irresponsible idea. Have you ever misjudged someone because you couldn’t accept their explanations and later learned what they said was true? Think how many arguments and conflicts are based on different expectations and experiences. Sometimes we assume that if it’s not our experience it can’t happen. It can’t be true so it can’t be another’s experience. Have you ever had that deep sense of joy and excitement about something you really wanted to do or be only to begin hearing the negative chatter? “You? Ha, no way! That could never happen. You know better than that.” Certainly, we’ve all had those times when we dismissed and walked away only to later wish we had waited a bit longer, made a different decision, or spent more time asking, seeking, and knocking. We dismiss people, relationships, ideas, opportunities, vocations, dreams all the time because we don’t understand. Because they do not fit our usual experience or expectations. Because they don’t make sense. Because the explanations are unbelievable. In dismissing what makes no sense, that which we don’t understand or can’t explain, we are refusing to open ourselves to something new. Sometimes that means we refuse to open ourselves to God. Isn’t that what Joseph is doing when he decides to quietly dismiss Mary? Joseph is dismissing the mystery of Emmanuel, God with us. He is dismissing not just Mary but the Mother of God, the very one who will give God human flesh, a body, the one who makes Emmanuel possible. That’s what often happens when we are dismissive. We foreclose the life and opportunities God wants to birth in us and through us. I am not suggesting that we ought to be naive, that we should be gullible, or that we should fall for anything and everything. I wonder, though, what we lose when we demand answers and refuse to live with questions. I wonder how often we miss our own life because we limit it to what we know, what’s familiar, what makes sense, and close our selves to the not-knowing, to something new, different, or unexpected. I wonder if we dismiss God with us by our searching for explanations and understanding rather than trusting and entering into the mystery. Ultimately, Joseph took Mary as his wife. However, he first had to move beyond what he understood and what made sense. He had to allow God with us to transcend the limits of his knowledge. He had to let go of trying to put it all in terms of a rational explanation. None of that, however, could happen between he and Mary. It would first have to happen within Joseph himself and it must first happen within us as well. It is a shift that happens within us. Mary and Joseph cannot simply talk it out or work through it. Think about it. Joseph notices Mary’s belly is growing. She’s gaining a few pounds. He is hurt and disappointed. He’s got questions. “Where’ve you been Mary? Who is it? Was it that time I was out of town? Why?” There’s really only one conclusion Joseph can reach. There is no other explanation that can make sense of all this. You can be pregnant or you can be a virgin but you can’t be both. Mary knows that as well as Joseph. It leaves her rehearsing what she will tell Joseph, deciding when and the best way to tell him, all the while knowing that he’ll never understand. How could he? She doesn’t understand. It makes no sense to her either. Matthew, however, doesn’t tell us about this or any other conversation. How odd that Mary and Joseph say nothing in today’s gospel. Surely there was a lot to talk about. Matthew’s omission of those conversations is intentional. Matthew doesn’t describe any of Mary and Joseph’s conversations because they just don’t matter. Making sense of this pregnancy, figuring out and explaining how it happened, is not the point. So let me go back to where I started. What is the most shocking part of today’s gospel? What makes you wonder if this story really is true? What is the hardest part of this story to believe? If Mary’s virginity is not the scandal then what is? The big scandal and shock of this story are not that a virgin is pregnant and gives birth. The real scandal is that God is with us. 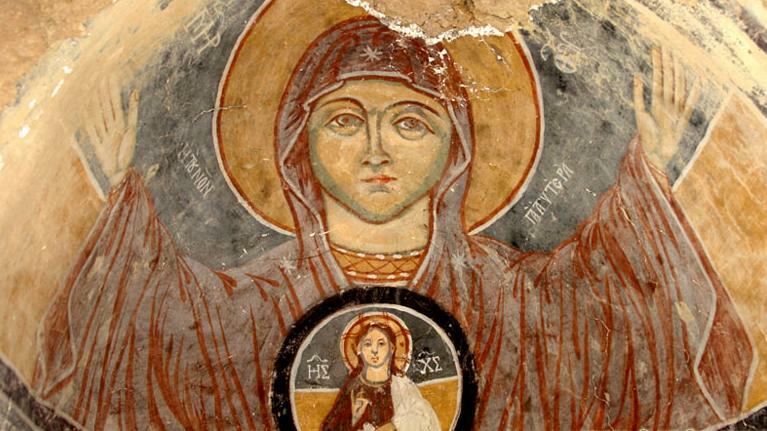 The shocker is that God through Mary takes on flesh and blood and comes to us. God is flesh and blood real. That means God is with us in people, relationships, ideas, opportunities, vocations, dreams. So why would we dismiss them? God is with you. God is with me. God is with them. God is with us in all the circumstances and situations of our life; in joy and sorry; in celebration and grieving, in success and failure, in hope and repair; in courage and parlaying fair. You name it, God is there with us. That’s the point of this story. Sometimes, however, the truth of what is gets lost or ignored in our attempts to explain how it is, to make sense of it, to make it conform to our understanding. Take a moment and look at the last week of your life, the last month, the last year. Who are the people you’ve dismissed? What relationships or opportunities have you quietly abandoned? What dreams have you walked away from? What happened? Why do we do that? Somewhere in those people, relationships, opportunities, and dreams there was something that made no sense. An explanation was lacking. Something didn’t match our experiences or expectations. We couldn’t understand what was happening. We didn’t know what to do. We couldn’t get straight in our head how it could all work out so we let it go, walked away. Another quiet dismissal. In the end we struggled, whether consciously or unconsciously, to recognize and believe Emmanuel, God with us. Here’s the deal. We all live on a spectrum between quietly dismissing Mary and taking her as our spouse. Joseph has shown us that. He reveals to us our own dismissive ways but he also shows us that we can take Mary and establish with her a relationship of commitment, love, intimacy. That is our final work in this season of Advent. It is our preparation for Christmas. It means that instead of analyzing and explaining how the story could happen we simply bask in its beauty and let the truth wash over us. It means that we are to see people, relationships, ideas, opportunities, vocations, dreams, situation and circumstances, the entirely of our life, though the lens of God with us. Instead of looking for answers let’s ponder what might be born in us, what needs to be born in us, what is waiting to be born in us. That’s how we open ourselves to the life and possibilities God offers us. That’s how we experience Emmanuel, God with us. That’s what Joseph did. He took Mary as his wife and opened himself to something new, something different, something unexpected, something unexplainable. He opened himself to the life and possibilities God offered and he named it all Jesus. Thank you Mags. May Christ’s birth be richly manifest in your life. Wow! Your words move me, Mike. Narelle, your comment reminds me of that part of the text that says, “When Joseph awoke from sleep … he took her as his wife.” I think we are always waking up to the commitments, loves, and intimacies – all the possibilities – God offers us. May God bless your work and make it fruitful. Whatever happened to ‘Dubito, ergo sum.’ as a perfectly acceptable state of mind, I wonder. I think it’s a matter of personal security. Answers are certainties, questions are uncertainties. It’s safer inside our houses, locked in, unexposed, invulnerable. The question then is: ‘What is wrong with being vulnerable, exposed, insecure? Why is it frightening? What is frightening?’ (Oh, I do like my questions!) And when we do ask these questions, we may realise that the answers are not that important. Questioning it already makes it less questionable. But I do want to give an answer, though. It may be frightening because of what is lurking out (in) there, all those mysteries awaiting, so keen to reveal themselves. Somehow, the possibility of accepting them is unacceptable. Are we forbidden to grasp them? Let’s not forget we lost the Garden of Eden once upon a time and all of its mystery, We left it, but can we still see it from the corner of our eye, can we still have a trace memory of it? But this soubds like a mystery within a mystery already. And it leads me to a ‘scandalous’ idea: understanding that I can’t understand everything. Not right now, anyway. So, I often find myself allowing mysteries to mature rather than be solved. I send them to an imaginary cloud (quite a fashionable idea these days, it seems. ;-), and leave them there, suspended. They always grow on me. Eventually. So, thank you, Father Mike, for the chance to ask more questions. Estera, thank you for these insightful thoughts and images. I love your phrase, “allowing mysteries to mature rather than be solved.” It suggests the mysteries have a life of their own and how could it be otherwise? They are in some sense the presence and revelation of God. Mystery offers us better questions and the questions, it seems to me, always take us further than do the answers. So maybe we should hold our answers lightly and let them lead to the next question. I hope Christmas joys and blessings have filled you and your family.